Other titles are currently being selected for inclusion in addition to the Victorian Serial Novels collection. 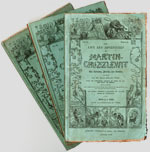 Throughout the Victorian period, novels in serial parts were published in abundance in newspapers and magazines—by far the most popular form—or in discreet parts issued in instalments, usually 20 monthly issues. Many 19th century authors established themselves by first publishing original fiction in serial format. Charles Dickens, Wilkie Collins, George Eliot, Elizabeth Gaskell, Thomas Hardy, George Meredith, Robert Louis Stevenson and more, all published serial novels, either in monthly magazines or as discreet serial parts. For details on each title and links to individual books and chapters, please select from the list below.